They’ll never be classed as great literature but the Art History Mystery series, written by art historian Iain Pears, will be entertaining and informative reading for the art lover who likes to leave their coffee-table art history tomes at home when they head for the beach. The series begins with The Raphael Affair, a story set in motion when Jonathan Argyll, an enthusiastic if sometimes bungling art historian, is arrested for breaking into a church in Rome in search of a lost painting by Raphael. His arrest introduces him to the beautiful Flavia di Stefano, of the Italian National Art Theft squad. Di Stefano takes an interest in the professor and his theories, and when the painting in question suddenly reappears and just as quickly is destroyed in a fire, the pair is thrown into a dangerous series of events, including a murder. In The Titian Committee, book two of the series, Di Stefano asks for Argyll’s help when she is sent to Venice to investigate the mysterious deaths of two members of the prestigious Titian Committee. Argyll involves di Stefano in his own mystery when an important art collection owned by the Marchesa di Mulino is suddenly stolen. Together they set out to uncover the truth, and discover the possibility of a lost Titian along the way. In The Bernini Bust, my least favorite of the series, the crime-fighting duo converge in Los Angeles, where this time a murder surrounds the disappearance of a Bernini bust destined for what is called “The Big Museum” (but which we understand easily enough is The Getty). In the fourth book, The Last Judgment, the pair is back in Rome — with a pleasant detour in Paris — once again investigating a murder connected to a painting of dubious origins. In Giotto’s Hand, di Stefano’s boss, General Taddeo Bottando, who was introduced in the first book, is attempting to track down a criminal masterminded nicknamed Giotto, who he believes has been responsible for the theft of priceless Renaissance art for over 30 years. When di Stefano discovers a lead in England she enlists the aid of Argyll, now her fiancé. Argyll finds the suspect, but he’s dead, and Argyll himself is suspected by the British authorities. In Death and Restoration, Argyll and di Stefano investigate the theft of what at first appears to be a worthless icon painting of the Madonna. Investigating the theft di Stefano runs into a trio of shady characters, one of who ends up dead. Meanwhile Argyll discovers the true history of the painting, which makes the story more interesting and the murder more meaningful. In the concluding novel, The Immaculate Deception, Argyll and di Stefano are now married, and she has taken Bottando’s place at the National Art Squad. When di Stefano is asked by the Italian Prime Minister to recover a stolen Claude Lorrain, she discovers how dangerous the proximity of politicians can be. Argyll’s investigation into a small painting owned by Bottando introduces him to another set of characters with their own conflicting motives. By this last book Pears seems to sense that his characters are running out of steam and he introduces a personal secret harbored by di Stefano to add some spice. 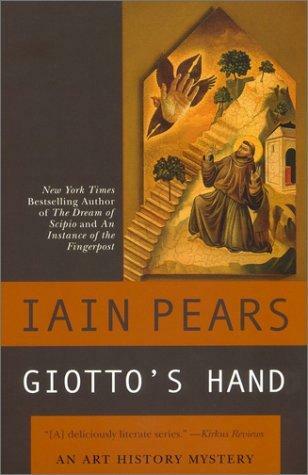 None of these is Pears’ best book. He has written other novels, and is best known (deservedly so) for his 1997 novel An Instance of the Fingerpost, a mystery set in 17th century England that has been compared to Umberto Eco’s The Name of the Rose (if for nothing else, because both novels are huge). But the books in his Art History series are easy enough reads, the mysteries propelling you from one page to the next; the writing can be witty and the settings are evoked in enough detail to provide a vicarious vacation for anyone who hasn’t made it to Europe in a while.